It was quite simply a case of excess demand outstripping even strong, rising supply. Both drove prices to extremes that few can afford. Eventually, defaults on those insane loans overwhelmed the market, sending the whole house of cards tumbling. 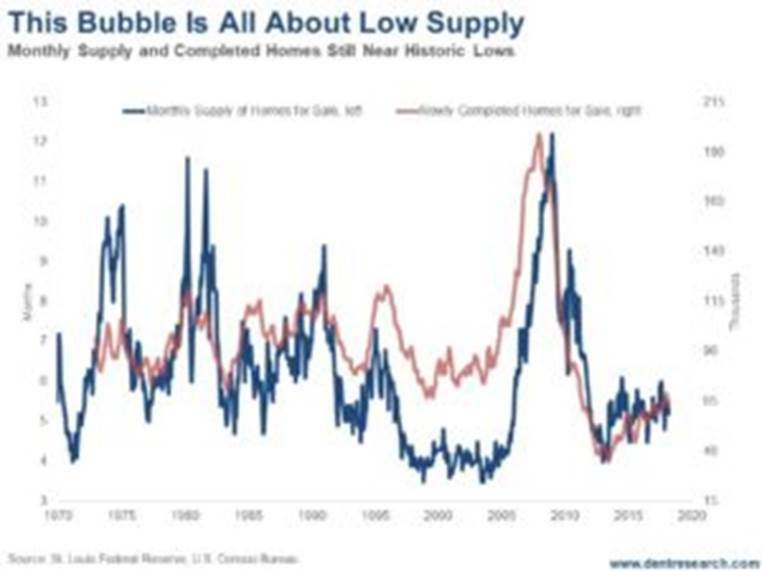 Supply (rather than demand) is driving this bubble. Baby Boomers have long since passed their peak home-buying cycle and Millennials don’t have the job and income growth the Boomers had. Besides, they’re more gun-shy after witnessing the largest real estate losses in more than a century, when housing collapsed between 2006 and 2012. Oh, and they’re facing tighter lending standards and the burden of student loans. You would never suspect we are in a bubble looking at this chart. Back in 2008, both new-home completions and months-supply-in-inventory were at all-time highs, and demand still outstripped supply. Builders were solidly behind that bubble, but on a lag, even after sales peaked in late 2005 and prices started to fall after early 2006. New homes completed peaked at 199,000 a month in June 2008. Inventory peaked at just over 14-month’s supply just before that. When the bubble finally burst, new homes fell to 35,000 in 2013 and inventory fell to just under four months’ worth. That was an 82.4% fall in home completions and a 73% fall in months’ supply – the highest on record. Home prices dropped on average 34% while houses in the bubbliest areas lost more than 50% of their value. The Great Depression only saw 26% declines on average. But, like I said: this time it’s not demand driving the bubble, but supply. Homeowners aren’t selling. Baby Boomers are holding onto the homes they bought into the last cycle as people do until they retire or die. Even near the top of this bubble, inventory is around five months and new homes completed are only 65,000 a month – not that far from the record lows. That is what’s driving higher prices! And it’s the worst on the low-end of the market. The supply of homes under $100,000 is 21% lower than a year ago. For homes under $250,000, it’s 8% lower. The median new-home price now averages $326,888 compared to the overall median home-price of $250,400 for existing houses. That means more people are having to pay more than they can afford, especially those who can least afford to do so! The trends are clearly showing, this time, that high-end real estate is starting to collapse first: from Manhattan to Toronto to London to Singapore. That may be the catalyst for the property burst I’m forecasting. The rich will be hit the worst in the end, the poor will be the first to default! This is the second and final real estate bubble we’ll see for some time. And it’s very likely to end up with losses closer to 50% on average. This is definitely NOT the time to buy. Rather, it’s an excellent time to sell and then rent until the worst of this collapse is over! Especially on the high-end.